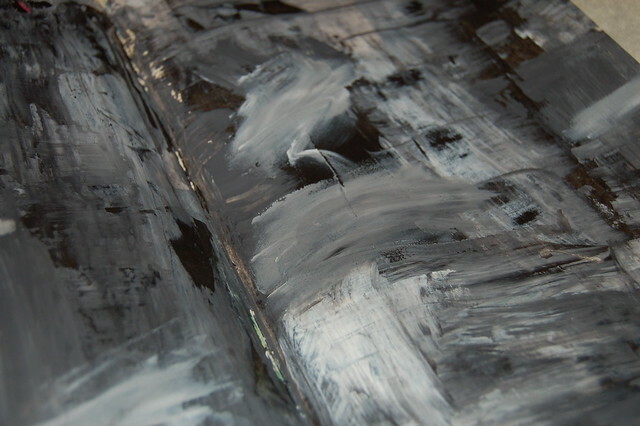 Today, as a creative exercise: paint a whole page (or spread) in your art journal, gray! Mix black and white together if you don’t have a tube of gray. It’s going to be awesome! I bet it is not a colour you paint with often? Or maybe you do. I always forget the more neutral tones and ordinary black, gray, sepia… I’m a girl of rainbow colours. But I am very happy with my gray art journal page! More details from my finished art journal page below! The whole spread. Gray can be such a classy sophisticated colour, but my spread turned into something else… as usual. Though the my word of the year 2011 (the “one word” theme that will inspire me throughout the year) came to me from this spread. I guess my own choices is something I’ve been thinking about, but when I saw it spelled out it was as the word choose me. And the word is: choose. 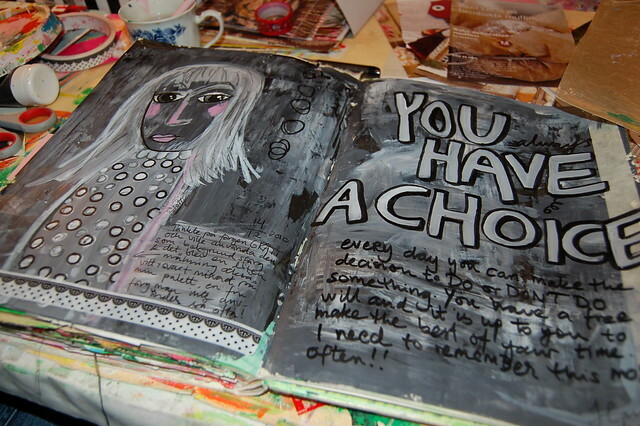 Thank you dear Art Journal for that! 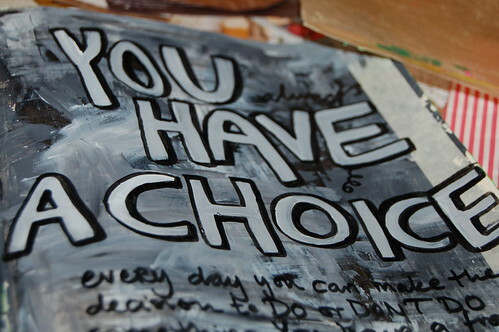 You have a choice! Make it. 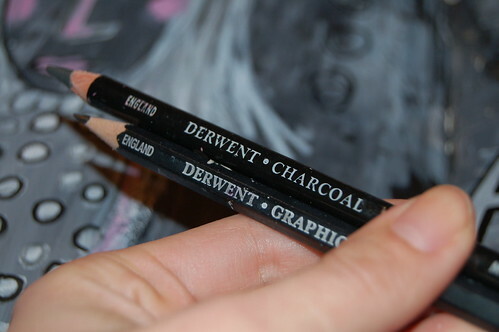 I love sketching and drawing with charcoal pencils. They smudge a bit and makes my fingers gray but I still really like them. 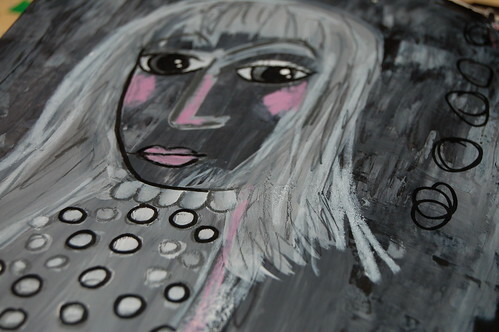 I like the serendipitous look when I paint a charcoal sketch and how the coal mixes with the paint. I drew a oblong girl and colored her, yes, gray! When the paint had dried I filled in the outlines with a black Artist Pitt Pen that I got for Christmas. Love how black the lines are! I hope you will play along. Tomorrow I’ll try to post another update on how the Art Journal Every Day goes! BTW: This is a Diana Trout inspired Creative Nudge (this one is #16)! She asked me to think up a little something, and share it on her blog, and I think gray is a great prompt! So why not? Feel free to post your pages to the flickr group the Creative Revolutionaries if you play along. This entry was posted in Art journaling and tagged acrylics, exploring colour, prompt. Bookmark the permalink. 10 Responses to Creative Nudge: Mix some Gray! This is a wonderful Nudge, Hannah, and your journal page is – as always – very inspiring. Thanks so much for giving me a nudge this week. Thanks for taking the time to comment, I appreciate that! Kira, thanks for the idea, I don’t think I can get gray gesso here but I will try to paint over it – it sounds like it would be fun. Yay, now I’m inspired too! Diana, thank YOU for allowing me to inspire and do a nudge, it was really fun! Came over from Diana’s blog to see the nudge. The grey is a wonderful idea but I was truly amazed by your word choice. That is the word that I chose for this year as well. If you’re interested, here is the blog post where I wrote about it. i love this creative nudge — and i like how it represents the “gray” areas of life — that nothing is ever in black and white. oh, this is a stunner. And what a great idea! I love Diana Trout, but hadn’t seen the nudges! I’m behind, again, but I can start whenever I wish! Need to go check out the nudges, these are new to me! Loving the monochrome look with the pop of bubble gum pink, especially the crisp blacks and charcoals.